The CPCU® 556 exam is the sixth CPCU® exam (personal insurance track) in a series of eight required exams to complete your CPCU® designation. This exam consists of 85 multiple choice questions split up into two sections: approximately 55 part A questions (concept questions) and approximately 30 part B questions (case questions). For more insight, see our blog about the CPCU® 556 exam format. According to nationally published CPCU® pass rates, the CPCU® 556 is typically one of the most failed CPCU® exams. As of writing this blog (the pass rates may have updated) the CPCU® 556 is the third most failed exam with a pass rate around 70%. The CPCU® 556 exam focuses on personal finance, including topics such as investing, social security, retirement saving, healthcare, and disability insurance. The reason this exam is tougher than most is because the concepts are so new. Unless you have studied finance or worked in the finance industry, these topics will be brand new. In the personal insurance property casualty industry we do not commonly deal with topics such as postsecondary education funding, healthcare, life insurance, retirement investing, and taxation. In particular, there are a ton of personal finance and investing topics that you need to memorize (including stocks, bonds, 401k, 403b, Roth IRA, ESA Accounts, and life insurance). We have personally reviewed the content and counted over 80 financial and investing vehicles that you need to be familiar with for this exam. Almost every single question on the CPCU® 556 exam will be based on some type of personal financial product, formula, cost saving technique, or tax treatment. The hardest part of the CPCU® 556 will be memorizing each personal finance vehicle, the minor details, and the tax treatment of each. The tax treatment of each personal financial vehicle is extremely important. Know the tax treatment of withdrawals, loans, and distributions from each financial vehicle. Also know which vehicles are tax deferred, tax deductible, and tax free. There are over 80 different types of personal financial vehicles, each with unique tax treatment and minor details. For each of the 80 different personal finance products you need to know the tax treatment of the contributions, distributions, cash withdrawals, and loans. There’s a LOT to memorize. Focus first on memorizing the definition of the financial vehicle. Then memorize the minor details, differences between each vehicle, and tax treatment. The 556 will try to trick you by asking about the minor differences between financial products. The exam will mix up the tax treatment of vehicles to trick you. Luckily we know exactly which financial vehicle and tax concepts you need to know. You can click here to download the list of financial vehicles and tax treatment that you need to memorize (we’ll also include a free practice exam with the download). Now that I’ve scared you, here’s why you’re going to easily pass the CPCU® 556. We’re going to learn from everyone else’s mistakes. Follow this plan of action while studying and you’ll have no trouble passing. 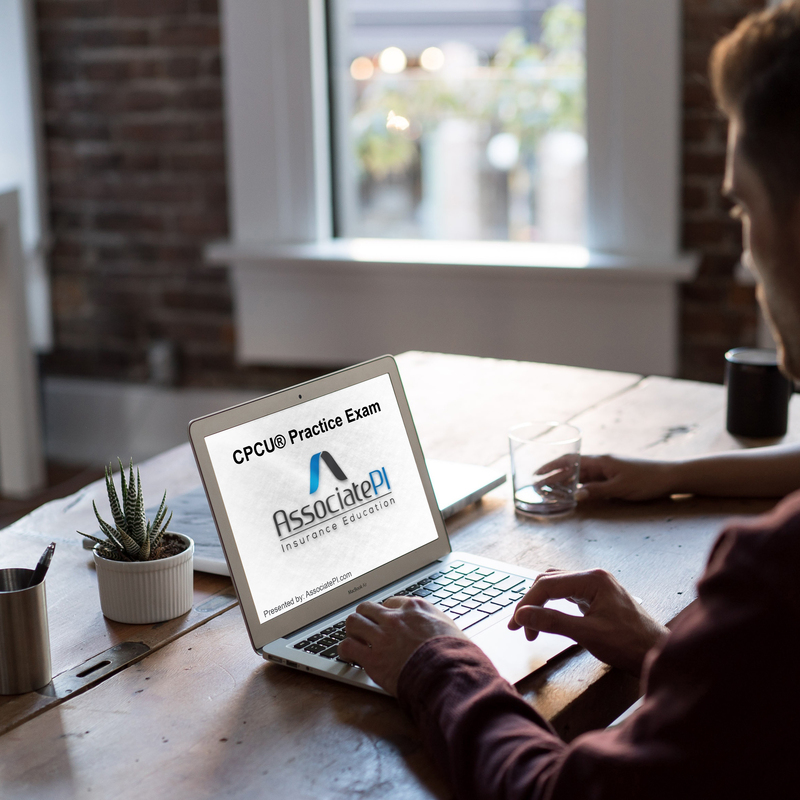 Be sure to download our free CPCU® 556 practice exam and list of financial vehicles to ensure you’re memorizing every financial product, minor detail, and tax treatment. Learn from everyone else’s mistakes – follow this plan of action while studying and you’ll have no trouble passing. Step 1: Read each chapter individually. Step 2: After each chapter, go back and jot down each financial product from the chapter. Step 3: Take note of the minor complexities and tax treatment of each financial vehicle. (trust me, this will be on the exam). Step 4: Compare each financial product to one another, study the subtle differences between each concept and tax treatment (the exam will try to trick you by mixing and mingling definitions). Step 5: Study the list of 80+ financial products as a whole – go back and look at your huge list of financial vehicles and make sure you have memorized each (memorize the tax treatment too). 1) Study each chapter: Treat each chapter like its own textbook. Read each chapter and memorize the financial vehicles and tax treatment as you go. Don’t wait until the end to memorize these concepts, you will be overwhelmed. 2) Make a study guide: Taking notes and making a personal study guide is a great way to improve your ability to recall information on the exam. Make sure your study guide is short and easy to quickly review; this will help you keep track of those minor details and creates a reference sheet for you to review rather than re-reading the textbook. 3) Practice, practice, practice: Take as many practice exam and quizzes as you possibly can. This will help you familiarize yourself with the CPCU® 556 question format and help you determine which topics you need to re-study. Once you go through a few practice quizzes and exams, return to your notes and review any section that you failed. Ready to get started studying? We’re here to help (for free). Download our free CPCU® 556 practice exam (comes with study guide and taxation guide) to get a feel for the type of questions you will see on the exam. Remember, every CPCU® exam is different. No single exam is the same. Be sure to study ALL topics (not just our recommendation). This resource is intended to provide you with a general idea of where your focus should be. Make sure to thoroughly study every topic of this exam. Difficulty rank, importance rank, and the advice provided in this resource are solely the opinion of AssociatePI. This resource is intended to provide you with a general idea of where your focus should be. Each exam administered by The Institutes is different. AssociatePI is not affiliated with The Institutes or involved in the exam writing process. Please be sure to thoroughly study every chapter and every topic of this course. CPCU® exams are administered by the American Institute for Chartered Property Casualty Underwriters (“The Institutes”). AssociatePI does not administer the actual exams, we are an independent resource of free content, advice, and study material for professional insurance education. This blog is intended for informational purposes only, to inform prospective students of the benefit of the CPCU® designation. CPCU® and API™ are trademarks of the American Institute for Chartered Property Casualty Underwriters (“The Institutes”). AssociatePI LLC is not affiliated with, associated with, endorsed by or otherwise supported or recognized by The Institutes in any way. AssociatePI LLC is not authorized by The Institutes to offer courses, practice examinations, or any other resources related to the Institutes’ designations or other programs. For further information, please email contact@associatepi.com. 6 responses on "CPCU® 556 Difficulty"